Welcome back, cadets, to another session of X-Wing™ Flight Academy! Over the last couple of weeks, we've talked about what you can expect from your ship and your wingmates. You need to know what role your ship is designed to play, and you want a good idea of how you're supposed to help your squadron. It's no good to try flying your A-wing like it's a bomber, and you won't be helping your squadron if you're exposing yourself early when you're supposed to be the closer at the end of a battle. These are vital pieces of information to absorb and process and carry with you deep in your gut whenever you fly to battle. However, they are just that—information. When the enemy jumps out of hyperspace and you're locking your S-foils in attack position, all that information is great, but it won't help you actually fly your ship. How do you approach the enemy? Do you race in full throttle? Do you spread out and approach slowly? Do you and your wingmates split up and try to flank your foes? 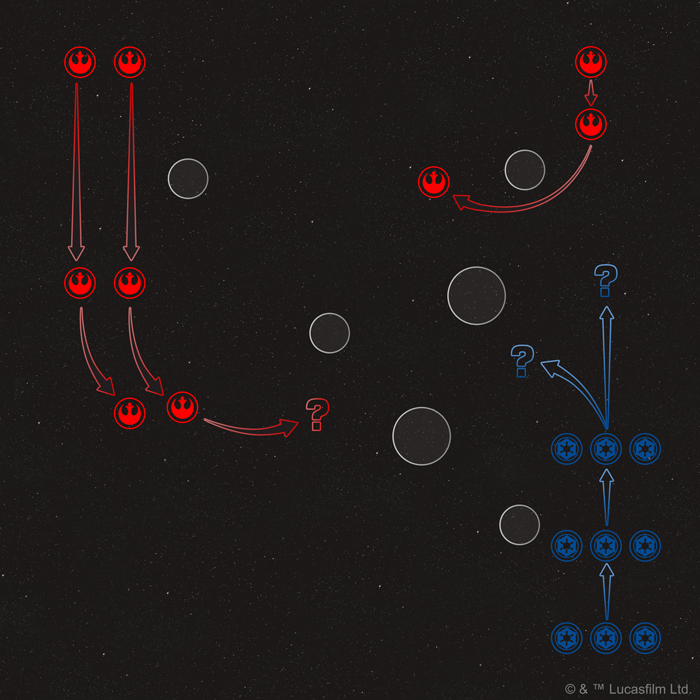 Sure, you know the role your X-wing is meant to play, and you know that you're supposed to draw fire away from your squad leader so that she can swoop in at the end… but how do you get there? Well, that's what we're starting to cover today with a look at that initial engagement. It's vital that you start the battle on the right foot, and that means getting the most from your opening shots. You want all your guns firing, and you want your opponent to land as few shots as possible. It takes skill to set that up, and so we're going to start by going over something we call "The Rule of 11." Taking you through the lesson is today's guest instructor and longtime X-Wing enthusiast Kris Sherriff. Kris Sherriff surprised his opponents at the 2017 World Championships by flying the squad he designed for his X-Wing 101 article. 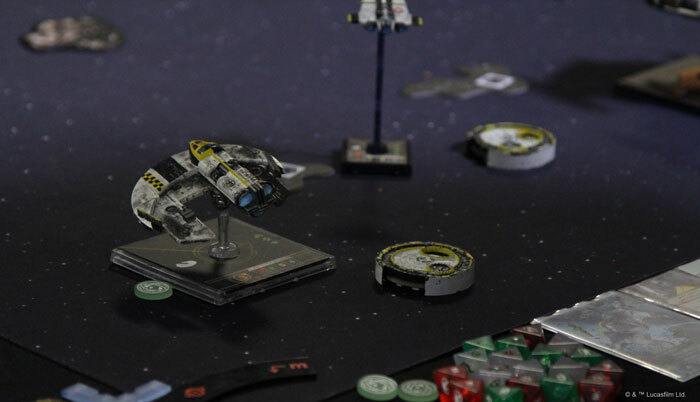 Kris Sherriff on "The Rule of 11"
The Rule of 11 is a fundamental X-Wing concept, and many among the game’s community assume that all players understand it—no explanation needed. But if you’re newer to the game, you may not yet have heard of this rule, so what is it, and what does it mean? The Rule of 11—Ships deployed directly opposite each other at the Range 1 line must close a total of 11 base lengths to end their movement within Range 3 of each other. Simple, right? It is, but the ramifications are profound. The Rule of 11 relies on the understanding that maneuver templates in X-Wing are placed at the front of a ship’s base and slot into the ship’s rear guides at the end of its movement. It also demands that you remember a small ship’s base is the same length as a straight speed-one maneuver. A large ship’s base is the equivalent of a straight speed-two maneuver, twice that of a small ship, and a medium ship’s base is 1.5 times as long as a small ship’s base, placing it squarely between a speed-one and speed-two maneuver. To put an extra range band between yourself and an enemy pursuer, you need to perform a maneuver at least three base-lengths faster than your opponent. That's a lot of numbers, so how about an example? If an X-wing reveals a speed-two straight maneuver, it will travel three base lengths forward. Let’s say it is flying directly at a TIE bomber that executes a speed-one straight. Between them, the ships will move a total of five base lengths. Given our understand of the Rule of 11, we know that there are still six base lengths to go until the ships will be at Range 3 of each other. This basic math forms the core of the Rule of 11 and it's particularly vital when you fly a list that aims to deal the majority of its damage in the opening engagement, such as if you were flying a squad of ships with torpedoes or missiles that are restricted by limited range bands or that require you to lock on your target before you fire them. A deeper understanding of the Rule of 11 leads us to the idea that pilot initiative matters for more than just who moves and shoots first. It plays into our considerations of when a ship will activate and if it can complete its movement unobstructed. If we continue our earlier example, our X-wing and TIE bomber still have six base lengths to travel before they are at Range 3 of each other. If the X-wing moves first, it cannot fly far enough that it will end within range to acquire a target lock. The X-wing’s fastest, speed-four straight maneuver would still leave it one base length outside of Range 3. If the X-wing pilot executed a straight speed-four maneuver, that would allow the TIE bomber to perform any of its straight maneuvers and land in the correct range band to obtain a target lock and launch its Concussion Missiles . Meanwhile, the unfortunate X-wing, which was unable to acquire a target lock, must fire its primary weapon instead of its Proton Torpedoes . What we learn is that a better understanding of the Rule of 11 and the two ships’ maneuver dials may have led the X-wing to open with a straight speed-four maneuver, allowing it to end turn two at Range 3 of the TIE bomber and acquire a target lock. What if You Don’t Fly Straight? The above example relies upon both players opting into a joust, in which they line up their ships, fly directly at each other, fire, turn around, and repeat—until someone’s ships have exploded in a hail of laser fire and “pew pew” noises. It’s trickier to take the information that we gain from the Rule of 11 and apply it to more typical scenarios, in which you need to approach the fight from a different angle. If you are flying against a ship with a turret or against an arc dodger and your opponent lines up this ship directly opposite your entire list, something is not right. These ships are highly unlikely to opt into a joust, and this is where some patience and understanding of the asteroid field can set you up for success in tournament play. In fact, asteroid placement is a topic worthy of discussion all on its own, but recognizing the areas of the table in which you want to conduct your engagements is vital. (In fact, three-time World Champion Paul Heaver actually addressed asteroid placement in his first “Turn Zero” article.) Simultaneously, we need to recognize that because we have 75 minutes to play our tournament games, we really don’t need to be attacking as early as turn two. A slow approach that avoids early commitment can go a long way to helping you find a favorable engagement. 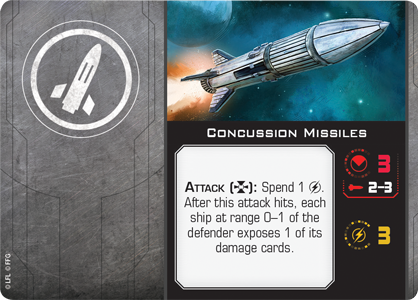 Committing to a speed-four or speed-five straight maneuver may seem like it will allow you to jump on isolated prey, but this is where you should ask your opponent about the ship’s dial and actions. The chances are that the isolated ship will have a speed-one or speed-two turn, plus an action that allows it to reposition after its maneuver. If you commit too hard to the chase, your opponent will just retreat that ship, and you will be left flying into a corner of the table while the rest of your opponent’s squad maneuvers in behind you. Here we see how the Rebels have successfully baited the Imperials into chasing a single X-wing. 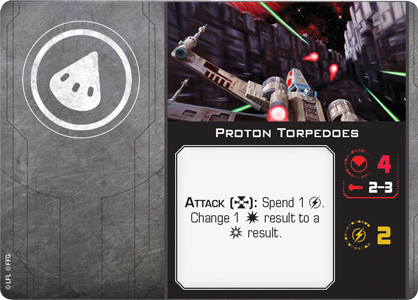 When that X-wing turns away from the Imperial squadron, however, the Imperial pilots face a tough choice: continue to pursue the isolated X-wing or fly into the asteroids in order to face the incoming ships. Alternatively, if you turn too early, you could leave space for that ace or turret ship to get behind your guns. A better option might be to look at the paths through the obstacles and plan where we can turn into them to cut off the enemy ship while using the rocks to protect our ships when the enemy comes back around. Here, banking toward a gap in the asteroid field could be better than plotting a turn into the same gap—if it leaves you more options in later rounds. As we can see, even once the Rule of 11 becomes a more complicated string of variables, it’s useful in the way it encourages us to consider the worst outcome of any given maneuver in relation to where our opponent’s ships could end their maneuvers. Kris has been playing X-Wing since the first wave of the first edition and shares his unique analysis of the game's newest and most interesting squadrons on YouTube.